Choose either one of our Pre-Made templates or the Upload Your Artwork selection. • For the premade templates, you just add your text. For some templates you may add your logo or choose a symbol to accompany your text. Most of the premade templates show your text in a ring around the outside of the design. In some of the templates, you may even add individual's names (to each sticker). • For the Upload Your Artwork selection you will be asked to send us our logo or sketch. If you want, we can take your artwork and add some professional polish to it - at no charge. Our art clean up and proofing are done, generally, overnight. • Patented 3M HatHugger materials give you wrinkle-free performance. Add your logo or graphic to any of these designs. You may upload your art when you order or email the artwork to us later. Choose a size from 1.5” to 3”. The 1.5” and 2” sizes are most popular. While the 3” size gives your logo the greatest impact for your logo, for many hard hats with ribbing, we recommend the 2” or smaller stickers. Add your logo and text to any of these templates. You may also change the color. It’s easy! Just add your text to any of these templates. Then, try out different color schemes. 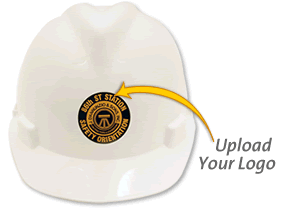 Stickers should contrast with the hard hat color. These affordable labels can be ordered on a full sheet (of 20 labels). You may also indvidualize each label! For example, make a label for each person, with their own name. Alternatively, you can order the same design for all of your labels and have the labels sent to you as single-cuts. All labels are “kiss-cut” so that you can easily separate the label from the peel-off liner. Find even more designs and custom options. Custom hard hat sticker rocks! OUTSTANDING! Thanks for the great looking custom hard hat stickers for our training program... the guys thoroughly approve! Great product, shipped quicker than promised. Spot a hat for Safety! They are a great size and since they are reflective I can see if a contractor is on my site and doesn't have the sticker - did a great job in getting them created and sent in a timely manner! Friendly service and good product. Will always order from here! I have ordered from this company a few times now. High quality stickers, great prices.